When Beer52 set out to create its very own box of experimental brews for The Elements Project, we wanted to work with a brewery that combined a rock-solid technical track record with a sense of adventure and creativity. When Beer52 set out to create its very own box of experimental brews for The Elements Project, we wanted to work with a brewery that combined a rock-solid technical track record with a sense of adventure and creativity. Anders Brouwerij was an obvious choice. Anders may very well be one of the largest, most respected breweries you’ve never heard of, as it doesn’t brew any beers under its own name; it’s a contract brewer, handling production for other high-profile breweries from Belgium and beyond. Founded in 2012 with a team of three, it had initially aimed to brew 3000 hectolitres in its first three years of operation. By the time it hit its third birthday, the team had expanded to 18 and the brewery had almost hit the 20,000 hectolitre mark. When Pieter joined in 2015, replacing the brewing engineer who had been part of the original team of three, part of his role was to plan out what he refers to as “Anders 2.0”. This meant a new brewery setup on a new site, five times larger than the original facility, with a total annual capacity of 100,000 hectolitres. This new brewery – in which the brewhouse, fermentation vessels, bottling line and logistics are all together in one 3000 sq metre room – will brew roughly 43,000 hectolitres in 2017, with plenty of room to grow. As we all know though, size isn’t everything; the more interesting story is the ethos that has underpinned Anders’ phenomenal growth. Very few of the brewery’s customers arrive with a recipe, saying “brew this please” – instead they rely on the expertise of Pieter and his team, and their knowledge of the kit to make the best beer possible. “Sometimes we just have to say to customers ‘that’s a great idea, but maybe try it this way instead',” says Pieter. “We certainly don’t take every idea or every recipe and brew it blindly. We talk with the customer and say ‘be careful, because with these ingredients after six months the beer will not be good any more, you probably won’t be able to export it'. For us that’s a duty to explain to the customer the consequences of making such a beer. 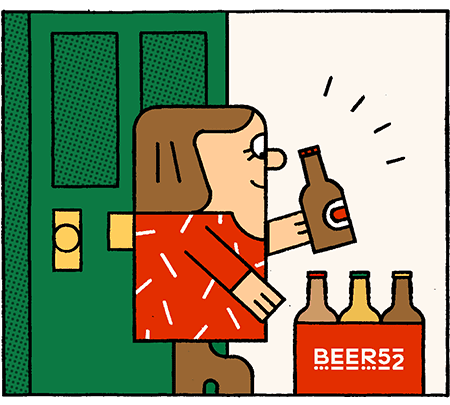 That bedrock of Belgian brewing expertise is definitely an advantage though, whatever style of beer you happen to be making, and was one of the main reasons Beer52 chose to work with Anders on The Elements Project. “The beer culture we have in Belgium has been a big reason for our success internationally I think,” confirms commercial manager Nicolas Volders. “We’ve always had a very wide range of different beers here – abbey beers, sour beers, saisons – so we have a lot of different techniques at our disposal. Other countries like France, Germany and Scandinavia were really only drinking lager for several decades. Beer52 was introduced to Anders by another of the brewery’s customers, nomadic brewer The Flying Dutchman. “When we first heard about The Elements Project it was very exciting. Do a pair a day though - don't try and work through them all in one go! Comparing recipes side-by-side isn’t something you’d usually be able to do as a beer-lover, but it’s the best way to learn about the characteristics of different yeasts, grains and hops, so it should be a great education and – we think – some very enjoyable beers. When we were working together on the recipes, we’ve tried to give a broad range of different characteristics so you can see the variety that can be achieved with small changes.